It is a recurring theme amongst socialists to argue that, if we only adopt the right system, a wonderful utopia awaits us. Indeed, the word “Utopia” owes its origin to Thomas More’s book of the same name about a mythical island where there is no private property and everyone takes what he needs. It is therefore an extremely appropriate word to use when discussing the aspirations of socialists. Quite simply, they believe in a world which has never existed and, wherever man has sought to create it, has resulted in a world closer to hell than heaven. Today marks the 100th anniversary of the Bolshevik revolution in Russia, a revolution which brought the Soviet Union into being. This was the first time that any government had had the opportunity to implement socialism. Without having to compromise policies to satisfy the electorate or to remain constitutional, the Bolsheviks set about a complete reorganisation of Russian life. Lead by Lenin and guided by the economic policies of Karl Marx, up to 20 million people were starved, worked or froze to death in the Gulags or were shot or tortured to death in the basements of police and secret police stations. Millions more starved to death either through incompetence and economic mismanagement, as in the famine which followed collectivisation in the 1920’s; or were deliberately starved to death as an act of genocide, as occurred in the Ukrainian Holodomor. From the moment the first shots were fired, the Bolshevik revolution unleashed nothing but violence and suffering. Stalin is claimed to have said that “one death is a tragedy, but million is a statistic.” Yet despite all their statistics, the Soviet Union never managed to create its Utopia. The state violently oppressed anyone who acted, spoke or thought freely in a cycle of paranoid purges. The misappropriation and misuse of natural resources by the state created an ecological disaster. And the inherent economic flaws of socialism kept the citizens so poor, that at the time of its collapse, former Soviet economist Yuri Maltsev estimates that the Soviet economy was scarcely 5% that of the USA. The Soviet Union is sadly not the only place that socialism has been implemented. 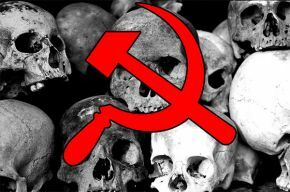 Worldwide, deaths from socialism are estimated to reach 100 million. Nevertheless recent surveys suggest more students would prefer to live under socialism than capitalism. It is perhaps a result of the influence of their professors (with universities being famously left-leaning); but it could simply be that they have not lived through it and seen the suffering that socialism causes, or been taught about it in sufficient depth. We at the Scottish Libertarian Party see this as a worrying development. For me this is not simply a study in foreign history or political theory. My wife is Russian and her family were amongst thousands forcibly deported to Siberia under the Soviet regime. They were lucky to only suffer internal exile; many endured far worse. In commemoration, therefore, we at the Scottish Libertarian Party will be holding a short ceremony for the victims of socialism in Russia and around the world. The event will be held at the Political Martyrs’ monument in Calton Cemetery, Edinburgh, at 1pm on Sunday 29th of October. Those who wish to do so are invited to join us. We feel that it is important that the world understands socialism for what it is and forgets neither its victims, nor the horrors unleashed whenever it is tried. 2 Comments on "100 Years on: Remembering the Millions who suffered under Socialism"
We’re not quite there yet! Yes, the Russian Revolution began on October 25 (on the Julian calendar) but that translates to November 7 (on the Gregorian calendar, which everyone uses today). It is great to see a spot of classical liberal or libertarian criticism of the backward Bolsheviks in Scotland.